Oran Kearney hopes Coleraine can vent their frustration on Linfield when they finally kick-off their season on Wednesday night. The Bannsiders have been forced to wait to make their Danske Bank Premiership bow after their scheduled opener against Portadown was postponed at the weekend. 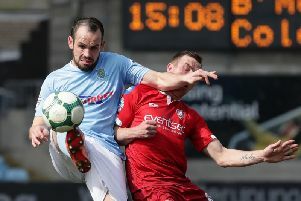 The Ports were suspended from all football activity by the Irish FA last week for failing to pay disciplinary fees for making undisclosed payments to players. The suspension was later lifted with the club’s appeal set to be heard later this month. Saturday’s postponement meant both Coleraine and Portadown missed the eagerly anticipated start to the season. But Bannsiders chief Kearney hopes his side can hit the ground running when they travel to Windsor Park on Wednesday. “Last week was a bit of a rollercoaster. Our match with Portadown was on, then it was off, then there were reports of it being on again. It wasn’t until Friday that it was confirmed that we wouldn’t be playing,” Kearney said. “You wait all summer for the opening day of the season to arrive, but when it does you are left in limbo while all the other clubs are kicking things off. While the opening day of the new Danske Bank Premiership season unfolded, Coleraine were hosting a family fun day and playing a friendly against Intermediate League outfit Trojans. “We managed to arrange something for the club, and we got another workout for the squad,” Kearney added. “Now we have to make sure we are ready for Wednesday’s trip to Windsor Park. “We are under no illusions how tough a test it will be. It has been a while since we won there, but hopefully the players can take out their frustration on Linfield. “We have to bring our A-game to the table, because anything less won’t be good enough. “Linfield won on Saturday so they are up and running and have points on the board. They will be confident. Kearney will be without new loan signing David Kee who cannot play against his parent club. Neil McCafferty is also missing – the midfielder is suspended from last season. “Neil’s suspension is carried over from last season, which is something I think should be looked at,” added Kearney. “He should have used that suspension up on Saturday, but with that game postponed it is carried onto Wednesday.